Recap: Down late, Taichi and Nishida are fighting tooth and nail to stay in the game. 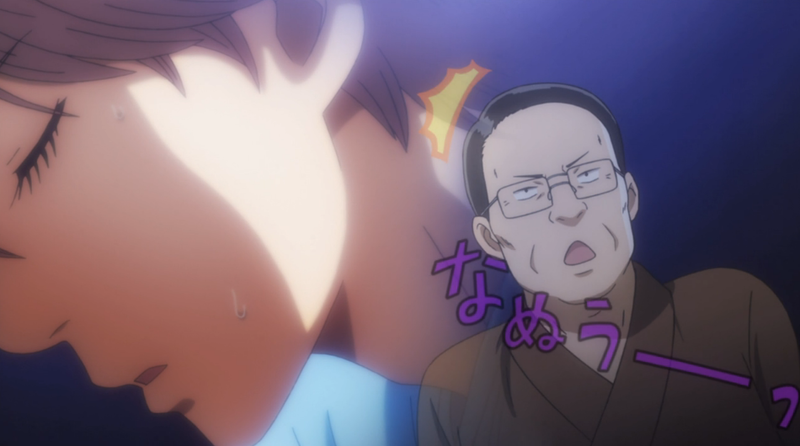 Chihaya firmly snares a win for Team Mizusawa, but can our seasoned guys hold out and bring the cup home? And I’d been doing such a good job at predicting outcomes in this show. 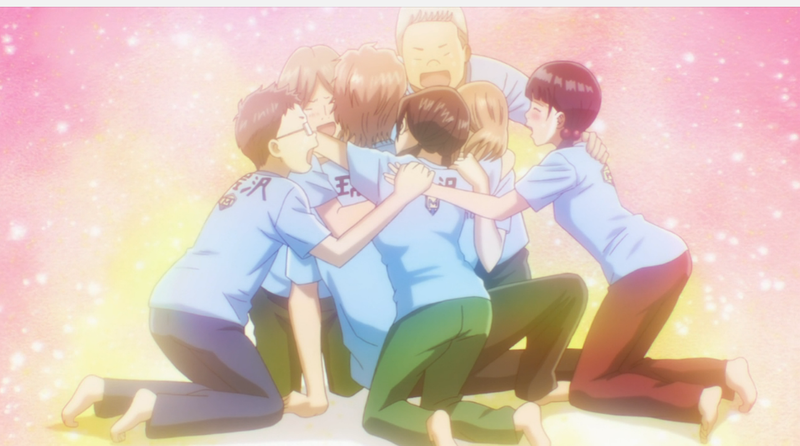 I suppose I’m glad to be wrong this time, this was a thrilling episode and Team Mizusawa really deserves it. As Hoosiers and Remember the Titans and so many sports shows have proved, watching the underdog win is always uplifting,and you can’t help but smile at the six man dogpile on Taichi at the end. Mizusawa is number 1 in Japan, and Mizusawa is number 1 in the world. If there is one problem I had, is that we go down to another luck of the draw scenario. I know it was really the only way to make this final as tense as it was, but if you look at the past three major fights, they’ve all had to be decided by it. Still, the writing has been good, and so each luck of the draw has really never felt the same as the last. Watching Taichi and Nishida coordinate their moves, learning from the mistake against Hokuo, was probably the best part of the match. As we go into the individual tournaments, our original trio finally reconnects. Chihaya may not be able to play, but if the Fujisaki coach is any indicator, she has already become a force to be reckoned with. None of the Fujisaki members stood a chance against her, and the only reason she ever floundered in the first place amounted to the karuta equivalent of home field advantage. It would make it that much more disappointing though, one of the biggest things I wanted to see out of the individual tournament was to see just how far Chihaya has gone by how far she can go. Still, with Taichi still on his quest for A rank, there’s still plenty of action to look forward to. It’s at this point I wonder if we’ll finally see some more of the romantic tension that’s been building up. 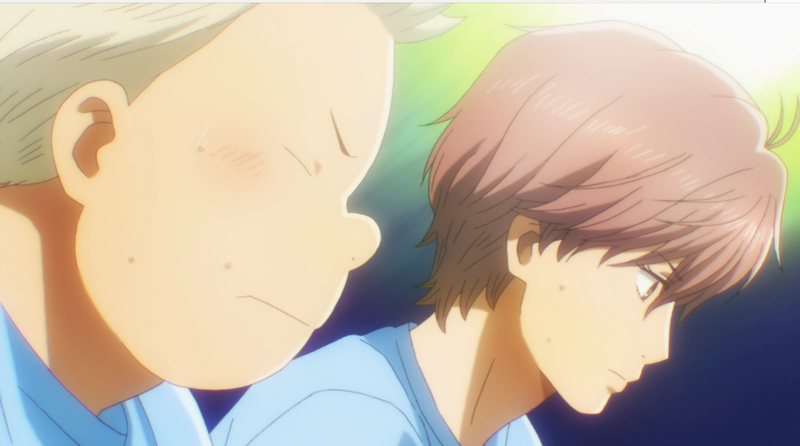 At this point I’m still amazed that Taichi feels threatened by Arata despite the fact he still hasn’t been much in either of their lives, even after they rekindled his love for karuta. Still, it feels like neither of the boys have given up the idea of pursuing her. I’m hoping this is the push needed for Taichi to finally man up and at the very least and take some initiative.